We’ve said it before, but we’ll say it again. DataMiner Platinum requires some math and reasoning skills. However, you get the choice between advanced math and simple math. Let me start by asking a question. Which math problem would you rather solve? 6 + 4 =? or "solve for x, where x2 – 4x + 28 = 12"
Unless you really like math (or just want a brain workout), most of us would choose the first problem. Now let’s say that you have to answer this simple problem using an advanced calculator such as a graphing calculator. There’s going to be a lot of extra buttons on there that you don’t need in order to solve 6 + 4. So what do you do? You ignore them, type in 6 + 4, and it gives you 10. You can use DataMiner Platinum in the same way as that advanced calculator. Let me show you how. After working in DonorSnap for a short while, you should be very familiar with the main contact listing screen. 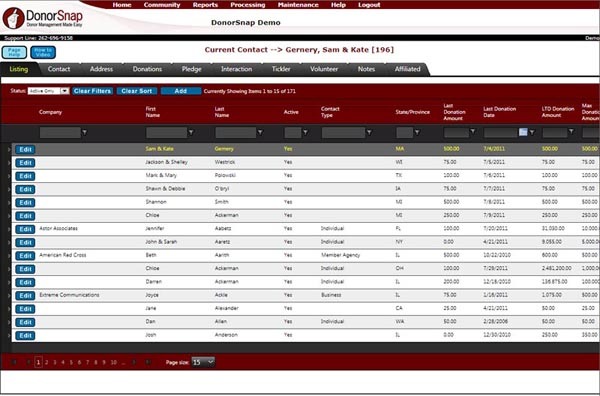 On this screen, you can sort and filter based on any of the fields you have displayed on your grid. If you can do that, you can use the basic features in DataMiner Platinum without breaking a sweat. You can skip the Query Builder altogether! If you can find the group you are looking for on the main contact listing, you can repeat the same process in DMP and export it to excel. Let's assume you are only using main contact data. Create a new batch title and save it. Skip the Data Export Selection, and move right to the Field Export Selection. Choose the fields you would like to export in your final list as well as the fields you would like to sort or filter based on. Then go right to the Review Data and Export tab. You can skip the Query Builder completely. Now it should look very similar to the picture above. You know what to do from here. Enter your filters and your sorting to target your group. Don't forget to hit SAVE before you export, and that's all there is to it. To see it in action, watch the Basics of DataMiner Platinum video. "A must read for all DonorSnap users!" Yes, DMP can require thinking. And yes, it can be a valuable asset. I don’t mean to scare you, but to use the advanced features of DMP effectively, you need strong math skills. This is where you wish you had paid attention to your high school math teachers when they told you that you would use all those math skills later on in life. In fact, my wife is a high school math teacher… I’m going to add it to her list of everyday life math examples. If you feel like you struggle using DMP, I hope to help you break it down a bit. The best way to start is by drawing a picture on paper so that you know exactly what you are doing and what you are looking for. It’s amazing how a targeted query becomes very manageable once you write it down and see it with your eyes. This is always our first step at DonorSnap when we create a new query. It really does wonders. Now I want to walk you through an example of how I go through creating a query.